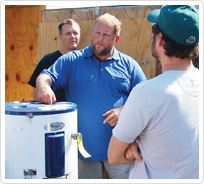 The California Center for Sustainable Energy (CCSE) is partnering with National Solar Trainers to provide a highly discounted, in-depth solar water heating training program designed to help attendees enter into this rapidly growing industry. In the workshop, you’ll learn the skills needed to launch a solar water heating career as an installer, designer, sales and marketing professional or entrepreneur. This comprehensive training typically costs $1,000-$2,000, but CCSE is providing it at a discount in support of developing the San Diego solar marketplace through the California Solar Initiative Thermal Program. The five-day training encompasses all aspects of solar water heating from fundamentals to business practices and hands-on installation. Days 1 & 2: Addresses solar water heating technology fundamentals, sales, marketing and business development. Days 3-5: Covers advanced system design and provide a hands-on solar water heating installation laboratory. Do I receive credit for completing this training? Yes! Participants who attend all five days to develop their all-around experience in solar water heating will receive a certificate of completion for 40 NABCEP credit hours. After completing all five days of training, students can choose to register for the NABCEP Solar Water Heating Entry Level exam online. The test must be taken within six months of registering. The five-day training costs $125, including a course workbook and lunch for all days. Whether you are new to the workforce, unemployed or changing careers, this training will give you the basic skills and information needed to advance your career in the solar water heating industry. Come join us in the Solar Water Heating revolution!